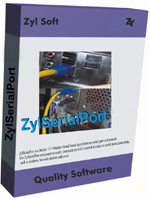 ZylSerialPort is a Delphi & C++Builder thread based asynchronous serial port component. Use ZylSerialPort component to easily communicate with external devices on serial port connection, such as modems, bar code readers, GSM modules and others. You can use it also with USB, IrDA and Bluetooth devices, because these devices have a driver that redirects the input from the USB, IrDA or Bluetooth port to a virtual serial port. ...... (you can check it in System/Device Manager/Ports). If your USB device is not provided with such a driver, then use a USB controller whose vendor provides a virtual serial port driver, such as FTDI or use a USB/RS-232 adapter. ZylSerialPort demo version is fully functional in Delphi and C++Builder IDE, but it displays a nag dialog (the licensed version will, of course, not have a nag dialog and will not be limited to the IDE). The package includes demo programs for Delphi and C++Builder and a help file with the description of the component. Qweas is providing links to ZylSerialPort 1.54 as a courtesy, and makes no representations regarding ZylSerialPort or any other applications or any information related thereto. Any questions, complaints or claims regarding this application ZylSerialPort 1.54 must be directed to the appropriate software vendor. You may click the publisher link of ZylSerialPort on the top of this page to get more details about the vendor.